Many people worry about being right. Optimist: One who, when he has the choice of two evils, chooses neither. Their viewpoint is right. Their side is the right. Their arguments are right. Their team is right. Their job is right. Their neighborhood is the right. Their lifestyle is the right. Their politics is right. Their religion is right. Their clothes are right. Even their charities are right. They spend a lot of time being right. However, if their viewpoint is always right, then there is a lot that is wrong with the world. And that starts to sound a lot like pessimism. Naturally, the alternative is optimism. It is probably not reasonable to just start being optimistic, but you can start to change your outlook through your actions. Start giving more, spend more time helping others, give more credence to how the small donations add up to a lot. Keep at it and I will bet you find a budding optimism growing in yourself. If you are down in the dumps and the world looks black, maybe you are spending too much time being right. And not enough time doing right. Yesterday’s gift of time … Gathered up all the cans and bottles that our family used and from my green run, donating them to the Optimist Club of Perry, Iowa. 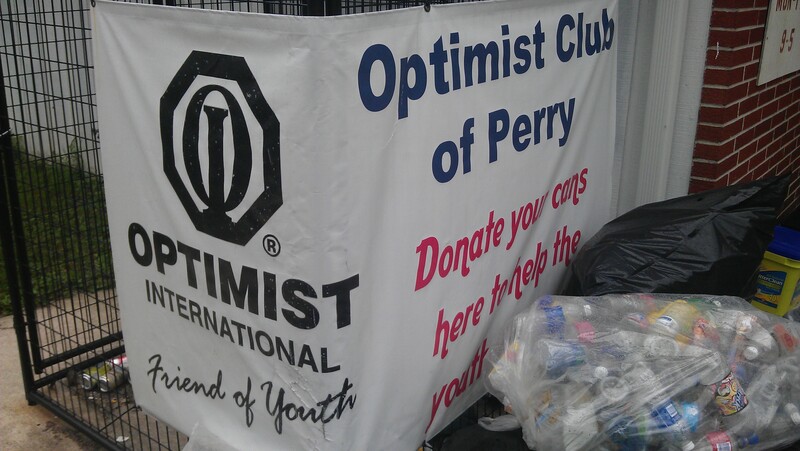 This entry was posted in In the community, While Traveling and tagged give time, optimism, Optimist Club of Perry, Optimist International, pessimism. Bookmark the permalink.